Well let me introduce ourselves and answer that question for you! Shiloh Rifle Manufacturing is a family owned business that has been established since 1976, and is the recognized leader in the quality production and craftsmanship of the incomparable Sharps Rifle. Each of our customers are special too us and we take great care in custom building a rifle to their desired specs and needs. When you purchase a Shiloh Sharps from us, you will carry with you a piece of history and the finest long range, competition and hunting rifle in the world. We are always a phone call away with tech support and any assistance that we may provide you and a lifetime warranty to the original owner. Our Company manufactures everything from our own barrels down to the screws we use to assemble your rifle. In 1996 we started our own Foundry and so all your sharps parts are cast in house which makes the quality control exceptional. We built this Foundry as the last step in producing everything in house. Each part that goes into your rifle is cast out of 4140 steel and then taken next door (Shiloh) to our machine shop where the work begins. When we built this foundry it took us 5,000 pounds of steel and 6 months of sweat and hard work to cast the first rifle parts that would finally meet our high standards and our customer's expectations. Once we finally met this, the sky was the limit and we were off and running. When a new order starts production we give you a serial number and then our wood fitters hand select the wood grade of your choice, inlet the stock and begin to hand fit each part. Our wood is American black walnut and comes out of Lincoln Missouri. During this time our barrel guys will start work on your barrel. The desired barrel length, weight and caliber. We use the best steel on the market which is specially made too our grade specs. Each of our barrels are carefully drilled using a machine that began its service to America in 1939 producing military barrels during World War II. Once your wood has been properly fit and bedded it will then go into our sanding room where our wood craftsman will hand sand the wood and work it in ways that is unbelievable. Our wood to metal fit is extraordinary and done with great care. No matter what grade of wood and if you have chosen a basic model with no upgrades or you have added upgrades, each one is handled with the same degree of work and care. Now, depending on those upgrades the fit stocks leave the sanding room and will start in with the different finishes. The double and triple A finishes are time consuming and carefully hand rubbed numerous times. Once the finish on the wood has been completed the metal parts are then taken to our metal polisher who strives to put the best polish on your metal rifle parts. He hand polishes and sands each piece, getting them ready to be color cased, pack hardened or French grayed. If you choose engraving then it requires a special polishing of the metal. Yes, you can have any model engraved with a custom designed pattern just for you or choose a standard pattern out of our book. Engraving compliments the fine craftsmanship of a Shiloh Sharps. All engraving is created by Suzi Bradley and is truly hand engraved and designed. When the rifle is ready for the metal finish we light our furnaces which we do every Friday and put the finishing touches to the rifle. Your choice of the standard color cased with the beautiful tiger stripe colors or the Pack Harden finish which has the old browns and blue going thru out the metal or the French Gray finish. Now, your rifle is ready to be reassembled and headed for the inspector's desk where he goes thru every little detail of the rifle. When this is done and given the final approval he brings it into the office where we pack it and make the phone call to let you know your new baby has been completed and ready for shipping or pick up. Shiloh Sharps is proud of what we produce and we will never sacrifice our quality. 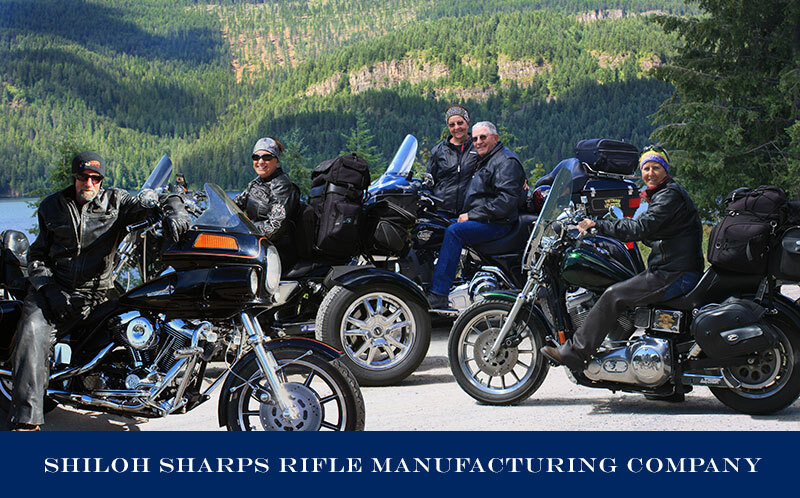 We are the only Company in the World whose parts interchange with the original Sharps rifles. Our motto here is quality not quantities. Our company will never outsource anything for cheaper prices. John Ruskin stated: "The bitterness of poor quality lingers long after the sweetness of low price is forgotten". Made in America doesn't get any better and more real than right here in Big Timber Montana. Your Shiloh Sharps is a 100% American made product. When you purchase a Shiloh Sharps, you not only purchase a legendary rifle, you support the principals of a way of life Americans have fought and died for over generations - self-reliance, pride and our FREEDOM.